This is a collection of traditional Christmas songs, the majority religious in nature, performed on traditional Middle Eastern acoustic instruments with underlying Middle Eastern rhythms. The arrangements are all instrumental. This album contains a collection of Christmas songs, mostly Christian, played on traditional Middle Eastern instruments. Most (but not all) of the songs follow the structure of opening with a solo on a single instrument (often qanoun), then swelling into a group of instruments playing together as the song progresses. For each song, a Middle Eastern rhythm is layered underneath the main melody line. The melody-line instruments used include zurna, bass, bells, bouzouki, qanoun, oud, and ney. The percussion instruments included darbuka/tabla, zarb, riqq, davul, tar, and kaçiklar. Generally speaking, the rhythms come through clearly and easy to hear. Deck the Halls 2:38 Yes Ayyoub rhythm. Up-tempo and fun. At one point, there is a dueling banjos effect between qanoun and oud. O Little Town of Bethlehem 4:04 No Underlying rhythm is slow chiftetelli. Contains an improvisational segment in the middle on ney and oud against chiftetelli rhythm. O Come All Ye Faithful 3:20 No Underlying rhythm is maqsoum with a joyful sound to it. Coventry Carol 1:17 Yes Played in the style of an oud taqsim. When it starts, it sounds like a typical oud solo, but then subtly slips into the recognizable melody of "Coventry Carol". No percussion or other instruments playing rhythm -- preserves the free-form taqsim format throughout. O Tannenbaum 3:14 Yes Spirited 6/8 rhythm. Lots of fun -- this has become my favorite arrangement of this song! Good King Wenceslaus 1:46 No Syrtos rhythm, with lots of energy. I really like it. Little Drummer Boy 3:52 No Slow maqsoum rhythm. Ends with a nice drum solo, but not even the Brothers of the Baladi can make me like this song. Joy to the World 1:53 Yes Played entirely on zurna. It's okay, but not my favorite track on this album. Uses ayyoub as rhythm. Angels We Have Heard on High 1:46 No Uses slow maqsoum rhythm. Silent Night 3:21 No Played as a ney solo, with an underlying chiftetelli rhythm. Very gentle sound. Away in a Manger 3:46 No Done as a qanoun taqsim without rhythmic accompaniment. The First Noel 3:20 No Some bouzouki improvisation in the middle. You enjoy listening to traditional religious-themed Christmas songs. You're seeking suitable music to accompany Middle Eastern style of dance within the context of a Christmas pageant or special church service. You'd like to play familiar Christmas music as background for a restaurant, Christmas party, dance event, or other occasion and you like the idea of using a Middle Eastern flavor for the arrangements of these songs. You're really not interested in the traditional European Christmas music. You don't feel a need to add Christmas music to your collection. The use of Middle Eastern instruments and rhythms gives these traditional songs a fresh new sound. I'm very, very tired of hearing ponderous or artsy-fartsy arrangements of these songs blasting me in malls, television commercials, and other places during the holiday season, yet I found myself enjoying these arrangements by the Brothers Of The Baladi as I drove along in my car. These arrangements provide pleasant inspiration for Christmas-themed Oriental dance fusion performance. The use of Middle Eastern instruments and rhythms gives them a sufficiently Middle Eastern spin to seem "right" for a seasonal show. The album contains a collection of a relatively large number (15) individual songs, so even if you don't like a couple of them, there are still enough others to make the album worth having if you like the general style of music. The liner notes contain a brief glossary listing 11 Middle Eastern musical instruments with a brief description of each. The artwork for the CD label is beautiful. It really attracts my attention. The collection is contaminated with the song "The Little Drummer Boy" which I really dislike. Even Michael Beach's drum solo couldn't make me like it. I found myself wishing there had been more secular songs instead of the heavy emphasis on Christian themes. I might use the Christian songs if dancing in a Christmas pageant or doing a liturgical dance, but for secular performances I prefer to avoid the religious songs. This collection of songs is certainly suitable for the typical things that people use Christmas music for, such as background music while driving in a car, mood music in a restaurant, etc. I personally wouldn't use the Christian hymns for belly dance performances unless it was within the context of a liturgical dance or Christmas pageant, with folkloric costuming. But the more secular songs such as "Deck the Halls" or "O Tannenbaum" could be fun to use for a belly dance performance at a holiday hafla. 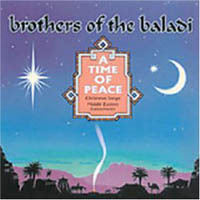 I have been familiar with Brothers Of The Baladi music since about 1986, and I have many of their recordings in my music collection. I always enjoy watching them perform live, because they project great energy from the stage and they come across as very dancer-friendly. Although we have had some e-mail correspondence and they once invited my troupe to dance in a live show that they organized, I wouldn't claim to know them very well.